Spring onions and asparagus taste delicious together, and can frequently be found side-by-side at farmers’ markets. 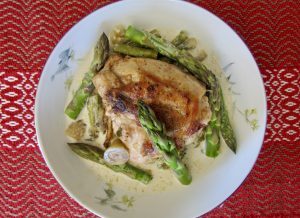 Asparagus is a true sign of spring, and it pairs perfectly with, no surprise, spring onions. Add some chicken, fresh cream, and just a touch of seasoning, and you’ve got a classic May meal. It takes no more than 30 active minutes to prepare this dish, and it’s on the table in a little more than an hour. 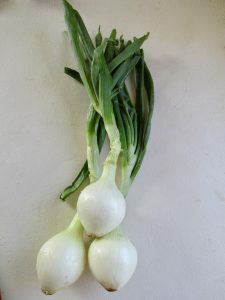 Spring onions can be sweeter than onions harvested later in the season. Pat the chicken dry and season with salt and pepper. Set aside. Slice the onion thin, reserving the onion tops for salads or soup. Chop the garlic, and slice the asparagus into bite-sized pieces. In a deep, oven-safe skillet (cast iron is an excellent choice), heat the olive oil or butter over medium heat. Brown the chicken on all sides until golden. Remove the chicken from the skillet and set aside. To the skillet add the onion and garlic, and sauté for about 5 minutes, or until softened. Add the beer and simmer until almost evaporated. Return the chicken to the skillet, add the chicken broth, cover the skillet, and simmer for 20 minutes. Stir occasionally, making sure to scrape up browned bits on the bottom of the skillet. 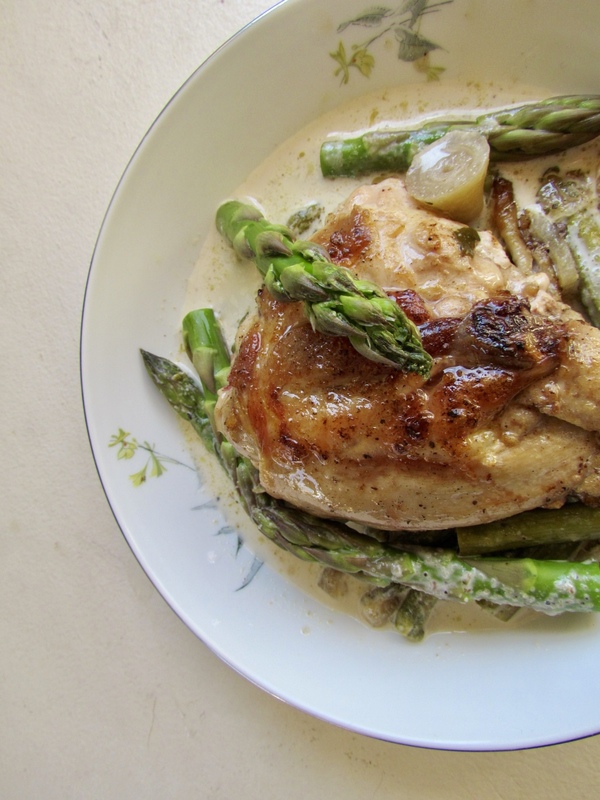 Add the asparagus, stir briefly, cover the skillet again, and simmer on low heat for an additional 10 minutes, or until the asparagus is tender and the chicken is cooked through (an internal temperature of 165 degrees). Turn the heat off, pour in the cream, and stir until combined. Be sure to not heat the skillet again, or you will curdle the cream. Add salt and pepper to taste. Serve with a fresh side salad, tortillas, polenta, or rice.